Patrol ship confronts ISIS jihadists in Sinai, in gunbattle ISIS scores direct rocket hit; Egypt says none killed. 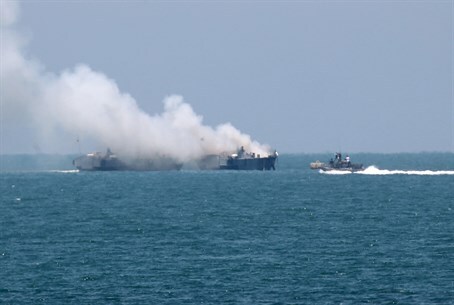 Islamic State (ISIS) terrorists in Sinai fired a rocket at an Egyptian patrol ship in the Mediterranean Sea on Thursday, scoring a direct hit and setting it on fire. The coastguard ship noticed the group of ISIS terrorists on the shore and exchanged fire with them, according to Egyptian military statements and witnesses cited by the UK Daily Mail. The ship was two miles off the coast of northern Sinai, and roughly two miles from the coast of Gaza. After the gunfight continued for a certain amount of time, the jihadists unleashed the rocket which caused the ship to retreat. According to the military, no soldiers were killed although several reportedly suffered minor burns. Egyptian army spokesperson Brig. Gen. Mohammed Samir wrote on Facebook that there no one on board was killed, but he did not detail how much damage was sustained to the ship or what type of craft it was. Security officials said the ship and others like it regularly patrol the area, and also are used often to transport soldiers and police officers from Sinai to the rest of Egypt. ISIS has been active in Sinai launching numerous large-scale attacks on Egyptian soldiers, ever since last November when the Ansar Bayt Al-Maqdis jihadist group pledged loyalty to ISIS and joined the group, switching its name to Sinai Province. ISIS has been expanding its presence as well; on Saturday the group attacked the Italian consulate in Cairo, marking its first strike on a Western target in the country.